Review: A troubled, 15 year old Joshua wanders into Carmel by the Sea, California. He is soon introduced into the art-forgery community. At the same time, he falls in love with Amber, a privileged girl from the wealthiest part of town. 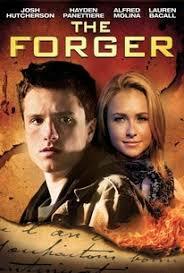 Great to see Josh Hutcherson in something else other than The Hunger Games franchise. This is Lauren Bacall’s final film before she passed away on August 12, 2014. This film is o.k. to watch on a Friday night when you have nothing better to do!